A documentary film has been making its way around the office this week. This DVD has changed hands again and again, and we have all spent time witnessing a year in the life of a man named Feliciano and his young family. 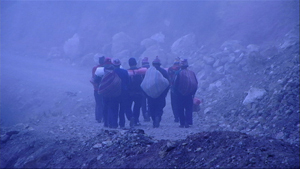 The film, Mi Chacra, or “My Land,” has been speaking to our company’s ethos in a unique way. Superbly filmed and scored largely with a traditional quena flute, the documentary manages to encompass the epic nature of the Andes mountains along with the very personal story of a family trying to make a life-changing decision. The story covers themes both personal and human, along with the larger issue facing all developing countries: that of rapid urban growth and shrinking rural populations. Beautiful scenery, and the exposure of a disappearing way of life come together to tell a story both foreign and familiar. As a travel company, we send scores of travelers on Inca Trail Tours to discover the mountains surrounding the Sacred Valley in Peru every year. 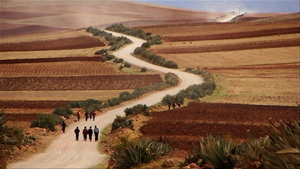 The permits to walk the ancient stone walkways, and soak in the majestic natural landscape of the Andes Mountains, are so sought after that they are usually sold out months in advance. But like in so many cases around the world, this is only half the story. Mi Chacra is about the other half. The film follows Feliciano, a farmer in the high mountain regions of Peru, over the course of a year from seeding his fields to harvesting his crops. As peaceful and beautiful as this life is, he did not choose it. When he was 16 years old, he was living away from his family, attending high school in the city, when he chose to return home and take care of his family after his father’s death. “Luck did not accompany me,” Feliciano says in his native Quechua, the language of the Inca, “and I lost my education.” He never achieved the goals his father set for him, and since then he has married, had a son, and stayed on his land for harvest season after harvest season. This is where you, the traveler, comes into the story. Your story and Feliciano’s intersect when he takes on the job of a porter for a company that guides people up the Inca Trail to the ruins of Machu Picchu. If you have ever had the privilege of hiking the Trail, you have seen the porters. They hike hours ahead, carrying packs twice their weight, and have a camp ready for you upon your arrival at your next stop. This is exhausting work that wears down the body, but Feliciano, like so many Peruvian farmers, welcomes the more lucrative work. There is no doubt that becoming a porter is a certain sacrifice for Feliciano. He chooses to sacrifice his wellness for the opportunity to save money. He will eventually sacrifice his land, his chacra, for life in the city and education for his son. What if he didn’t have to sacrifice his wellness? What if being a porter paid even more? Global Basecamps and its local Peruvian partners strive to treat all porters well because we want this decision to be an easier one. We pay them better, they carry less weight, and walk shorter distances every day. There are many Feliciano’s, not just in Peru but all over the world, all looking to save money for a future and for a goal. The truly special thing about international travel is that it brings money from other countries and deposits it in communities such as Feliciano’s. 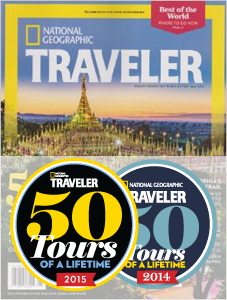 And the more we, as travelers, act locally while traveling globally, the more Feliciano’s goals can be accomplished. This is what sustainable travel is all about. This is why Global Basecamps advocates booking locally owned services, and leaving travel destinations better than we find them.